Will has dedicated his practice to plaintiff’s personal injury and wrongful death cases, including occupier’s liability, products liability and disability benefits claims. 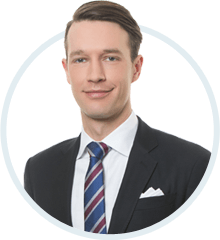 William Keele (“Will”) is a personal injury lawyer at McLeish Orlando’s Toronto office. He is passionate about helping injured people obtain financial security for their future, and return to all meaningful aspects of their lives. Since his call to the bar in 2010, Will has represented seriously injured people and their family members in a wide variety of cases including motor vehicle collision, wrongful death, slip and fall, and disability benefit disputes. He has appeared as counsel before various levels of Ontario courts including the Small Claims Court, the Ontario Court of Justice, and the Superior Court of Justice. Will has contributed to a number of legal textbooks and publications, and has authored and co-authored papers for The Ontario Trial Lawyers Association, and The Law Society of Upper Canada. Will lives in Toronto with his wife and two children. In his spare time he enjoys spending time with his kids, running, attending concerts, and skiing. Blog: Experts for Hire: What use can be made of past judicial comment? Blog: Do You Really Need Home Insurance? Blog: How Do I Know if I Have a Medical Malpractice Case? “Why Demonstrative Evidence? And Why Is It So Effective?” The Oatley McLeish Guide to Demonstrative Advocacy, (Co-Author with John A. McLeish) 2011. “Bad Faith: Practical Strategies”, Insurance Law You Need to Know (Co-Author with J. Patrick Brown), Canadian Bar Association, October 1, 2010.